Google has launched its new Android Q. Last year, Google launched developer preview of Android pie, but this time the company has launched an Android Q Beta version. Google has introduced Android Q Beta 1 update. Android Q Beta is first release to the Google Pixel Series. Users can install this update on Pixel 3, Pixel 3XL, Pixel 2 and Pixel 2 XL. Here we are giving you information about the best features of Android Q. It includes many features from Privacy Protection to Foldable Factors. Here we are telling you about 7 best features of Android Q. The features of the Android Q are the most important feature security. Users have more control over their phone applications through this feature. Under this option, the app will be able to track the location when the app is used. At the same time, the app will not be tracked when the app is not in use. However, this feature is not just about location sharing, but it will help to control the application even further. The company says that the Android Q version is part of its project Strobe. This will not require users to give different app access to each app. this feature is a best features of Android Q.
Android Q has been supported with a foldable smartphone. The company has improved the split screen in this new android Q, which allows for better use of foldable smartphones. According to Google, the company will support developers to create an application that supports a foldable display. There are also onResume and onPause functions that support multi-resume. The Android Emulator supported in it supports multi-display types. Sharing this feature under the Android Q becomes easy. This allows users to go directly from one app to another to share content. It is capable of jumping on the second app faster than ever. This feature works just like the App Shortcuts. In such a situation, Google is pushing the ShortcutInfo API to simplify integration. This API provides the option of direct share to pre-Android Q devices. Google has supported Wi-Fi Standard Support, WP3 and OWE in the new Android Q. This will improve the security for home and work networks. Android Q will be given High performance WiFi mode and the latency will be reduced. This will improve gaming and calling performance better than before. Apps in Android Q can request for dynamic depth images. This will allow you to offer special Blur and Bokeh effects in the app. Google has said that data can also be used in the future to create 3D images or to support AR photography. Let us know that dynamic depth is an open format that works with the manufacturers, so that it can be made available in more and more devices. Android Q has been supported with new audio and video codecs. According to a website, the theming options have been given in the developer settings of Android Q. In this, users can choose different colors. You can also choose headlines and body fonts. Along with this Icons’ shape can also change. 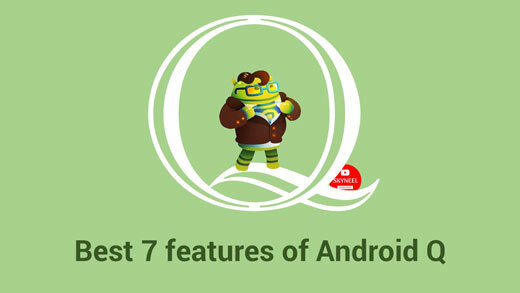 In this article we have told you about 7 best features of Android Q. If you liked this article then you can also like our Facebook page and subscribe to our YouTube channel too. If you have any problem related to this article, you can comment and tell us.